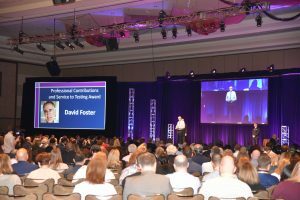 Midvale, UT — In front of more than a thousand members of the assessment community, Dr. David Foster, Caveon CEO and Co-founder, was honored to receive the Association of Test Publishers’ Award for Professional Contributions and Service to Testing. 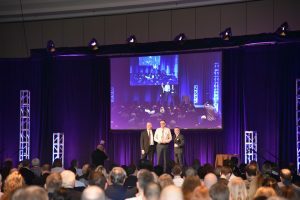 The award was conferred on March 18, 2019 in the opening general session of the Innovations and Testing Conference to commemorate Dr. Foster’s lifetime of tireless dedication to the testing industry. The award, according to the Association of Test Publishers, “honors individuals who have made a positive impact on the industry of testing through professional contributions and service,” which includes service to peers and colleagues in the industry, as well as tangible improvements to testing itself. Awards Committee Co-chairs, Alina von Davier and Robert Pedigo, selected Dr. Foster to be the 13th recipient of the award after a rigorous ballot and review process that included input from representatives across the entire breadth and depth of ATP’s global activities. Among the honorees is another Caveon Co-founder, John Fremer, who was the first person ever to receive this award in 2007. Caveon joins the testing industry in appreciation of the meaningful contributions that Dr. Fremer and Dr. Foster have both made to the assessment space. Founded in 2003, Caveon is the industry’s first and only full-service test security company. Caveon is dedicated to defending the validity of test scores through their innovative technology solutions and their comprehensive security approach. As the best-in-class test security provider, we are at the forefront of industry best-practices, and have proven and customizable solutions designed to protect high-stakes testing program’s most valuable assets—their assessments. For more information about this release, or any of Caveon’s services, please contact us at (801) 208-0103 or info@caveon.com.